You are here: Virgin Islands News Online » News » Sprinters at the Double in Rey O’Neal Fast Times Meet! 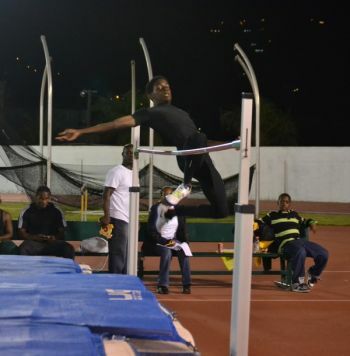 Turnbull would clear 1.80m and Bradshaw 1.60m. 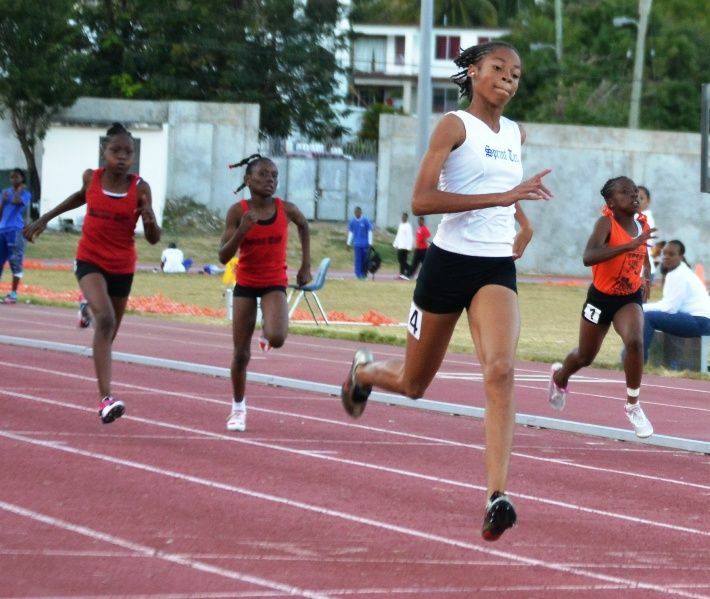 Earlier, Beyonce Defreitas had underlined her blossoming talent with a sprint double in the U13 100 and 200 metres with times of 13.2 and 25.67 respectively. Gia Malone took second in the 100 in 14.29 with D’Neigh Williams 3rd in 14.31. Anique Daniel came home second in the 200m with a time of 28.70 and Malone claimed third in 29.02. For the Boys, Koen Penn claimed a sprint 1 and 2 double with times of 13.34 and 27.32, holding off J’Quan Smith on both occasions. Chaz Fahie took U13 600m Boys honours and Kedrick Matthew stormed to the line in the Boys U15 100m in a time of 12.49 secs. Daniel won the Girls U13 600m in 1:52.96 before Kiarra Huggins continued her come back from injury last season with a winning time of 13.14 in the U15 100m. Zakharia Frett finished second in 13.20 with Shaniyah Caul third in 13.49. 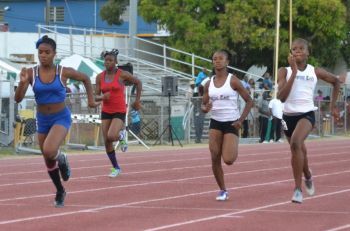 Frett then returned to take top spot in the 200m, leading home Arianna Hayde in 26.68 to Hayde’s 27.54. Caul finished third in 27.80 secs. The closest race of the night was in the Boys U15 200m when K’Cei Moses just held off Khoy Vanterpool to win in 25.06. Vanterpool, who had also finished second in the 100m, finished in 25.85 secs. The U15 800m saw a Raw Skills 1,2,3 with Mariah Christian just holding of J’Sally O’Niel with times of 2:48.94 and 2:49.21 respectively. T’Keyah Richardson was third in 2:55.58. 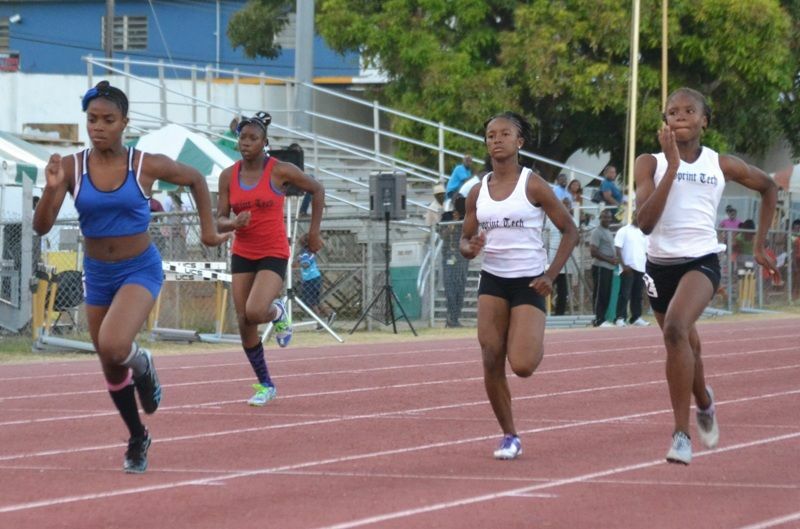 In the U17 100m Kala Penn took time out from preparing for the Triple Jump to win in a time of 12.77, leading home Chelsea Flax-Solomon (13.18) and Jasinique Frederick (14.00). Back in the Triple Jump, Penn would land in the sand at 11.45m for victory as she, Niayla Smith and Shanaky Wheatley competed in front of a crowd for the first time on their learning curve. Turnbull landed at 11.73 as the only male competitor. Kyron McMaster added his own sprint double in the U17 Boys with times in the 100m of 11.46 seconds and the 200 of 23.18 secs. He pipped Ronique Todman in the 100m by just 0.02 secs. to claim victory. In the U20 100m, Jonel Lacey pushed Taylor Hill into second place with a slight back injury hampering Shiain Vanderberg into third. The times were 12.36, 12.38 and 12.67 with Shamica Glasgow fourth in 13.21. Lacey made it a double when she held off Taylor again with a time of 25.46. Running in the U17 200m, Tarika Moses beat out L’Tsha Fahie with her winning time of 25.44 before returning to set the pace for Lakeisha Warner’s 800m performance of 2:11.81. In Field Events, Trevia Gumbs lobbed the 4kg Shot Put to 11.98m with Kiwana Emmanuel recording an 11.79 in the 3kg, just a cm outside of a Carifta qualifying mark. Another Gumbs prodigy, Djimon, threw his 1kg discuss 21.84m and Dylan Moses went 31.07 with the 1.5kg version. Eldred Henry hurled a distance of 50.37m to see off Kevin Vanterpool in the Open Category. Ashley Marie McCall leapt 1.50m in the High Jump as would Ashley Penn with Abigayle Bartley finishing at a height of 1.30. 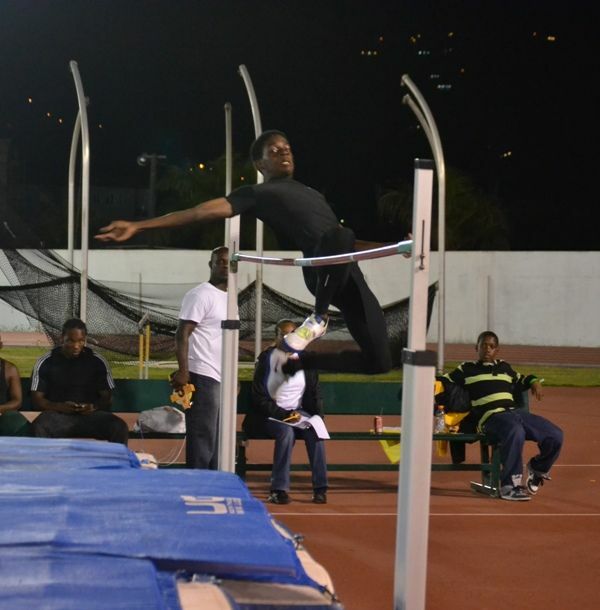 This Friday, March 8, 2013 will see the start of the National Junior Championships and Carifta Games Trials. I always thought the young lady there Beyounce was older because she always run with those older girls. That's the first time I saw her run in her age group and she really outclasses them so I guess that's why she runs with the older girls. She looks like she can be a special athlete like Chantel, Mimi, Tarika, Karene and teh rest of those girls. We need the community to come out and support and encourage these kids. The coaches and parents can't do it alone.